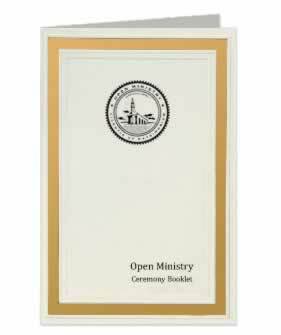 This exclusive Ceremony Booklet is a must have for any minister or officiant. A perfect size to travel with, read when performing a ceremony or use for inspirational reference. With this booklet easily customize a variety of ceremonies; includes readings, outlines and helpful information. Most of the samples and guides are based on love with fairly neutral wording and can be adapted. Includes the Open Ministry name and official seal. This is just what I was looking for.. It arrived well before I was expecting it, I know w I will get years of use out of it, as a matter of fact I'm performing a wedding service with it today !!! What an excellent reference material. Many different ceremonial service suggestions and the booklet itself mirrors the quality of everything I've requested from Open Ministries. Great price. Book could be a little bigger for the print to read. This booklet is full of useful information not only for myself but for the couples that I am performing their ceremony. The Booklet was very helpful, on how to preform a marriage with a lot of good tips. A very well thought out and extremely handy ceremonial booklet. excellent booklet to get you started. JUST A REMINDER: it is also important to make sure that the people that you are marrying are equally yoked to be married or that is blasphemy of the holy ghost. greeting and blessing, i am very happy with everything i have received, thank you very much for the professional service.